Trademark of classic Chinese indulgence, Jumbo offered a fusion course catered to local appetite. Seafood was their signature dishes, never a letdown with consistently good quality presentation for patrons. Dinner at Jumbo was a pretty last minute decision, luckily table for two was immediately available. Attracted ambiance and vibrant nightlife at Clarke Quay, service was efficient and prompt. Fresh Crab remarkable promise, it was always a salivating eager for me. Pipping hot of pot served right up, portion rather huge. Chilli gravy was incredibly fragrant and starchy, little overpowering but appealing. Great pairing with deep-fried Mantous, bun was crispy on surface and softly tender inside. Spicy hint by dipping into broth, the feeling left was luscious satisfying. Special dessert was a correct option, sweet and sour fruits in icy mixture. Syrup base was the perfect way to finish up the meal, serving was just nice. It a crowded and lively place, I like the environment and will make my return again. Jumbo is a good seafood place to go to for classic Singaporean seafood dishes. I ordered chilli crab this time and it was pretty good. The chilli sauce was quite spicy so some may not be able to handle the spice. The crab was fresh and quite meaty except that it was pretty expensive at abt 55 dollars per kg of crab!! The mantous were delicious when dipped in the flavourful sauce, but they were abit small in size. 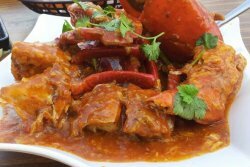 Even though I did not get to sit inside the air-conditioned environment due to is already full house in the indoor environment, still I am still happy to enjoy my favourite chilli crabs outside the windy outdoor environment. These chilli crabs from Jumbo seafood is definitely fingers licking good! 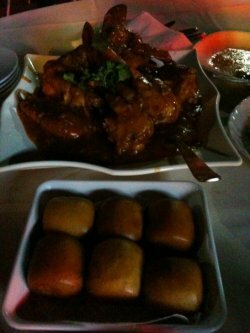 The sweet chilli sauce gravy is super thick and flavourful. 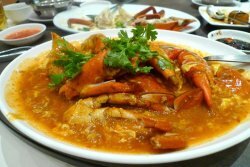 The crabs used in this dish is very big in size and the crab meats in it are very light and fresh, very sweet too. 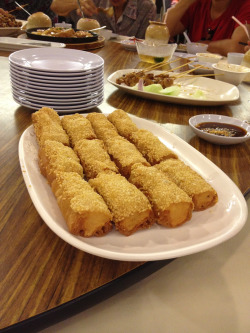 Eat on it own, or with a plate of plain rice or with their deep fried bun taste equally delicious! Moreover, the service staffs and the restaurant manager are all equally friendly and approachable. Came here one might for a friend's going away party. Got lucky and was sent to a table instantly, rather than the party ahead of us who had to wait 45 mins. This jumbo seafood restaurant is at Riverwalk, across from Clark Quay and on the water still. This night we got a table outside but still under cover, the rain had just stopped also. Since we had a few other people in our party, we ordered a bit more food than usual and it turned out to be just enough. 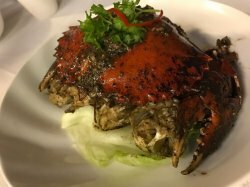 The black pepper crab was the single best item ordered. The crabs overall seemed a bit small compared to Spring Court but not bad still. The chili crab was OK but the sauce was a bit thin and definitely not as good as East Coast or Spring Court. The fried buns were delicious as always (but are these ever bad? anywhere?? ), the kang kong tasted the same and the fried rice was good too, nothing especially good though. An enjoyable meal overall but not the best of anything. 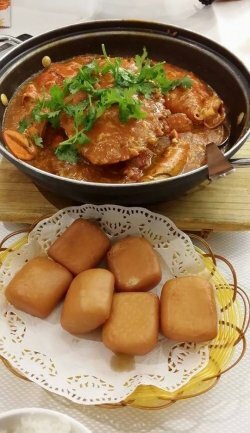 We ordered Jumbo’s signature dish: the Jumbo Chili Crab, and of course we would not have forgetten to order the must-have side dish – fried man tou. What I like about Jumbo’s chili crab is the sauce. 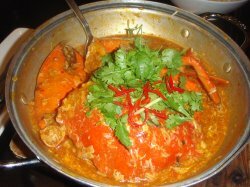 It isn’t far too spicy and oily like many chili crab dishes in Singapore, and it is unique to jumbo. Moreover, the crabs are always fresh and the served with their shells cracked slightly, making your life easier when struggling to crack open the crabs. Additionally, you can buy the packaged version of jumbo’s chili crab sauce back home to try and prepare your own home cooked jumbo chili crab. We bought 2 of the packages ( 1 chili and 1 black paper), but have yet to try them out. Was wondering whats the hype about Jumbo Seafood's Chilli crab, where the whole of Singapore recommends it. Though we're not such great fans of Seafood, we thought we'll try it out , so went there for a family reunion.
. especially people holidaying in Singapore, You should have Jumbo Seafood---chilli crab at the top of your 'TO DO List' in Singapore. The Menu is reasonably priced as well. 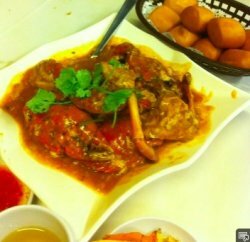 its crab day for me and friends =) as usual Singapore spicy chili crab.. minor sour .. hot with eggs.. and crispy man tou..~~!! 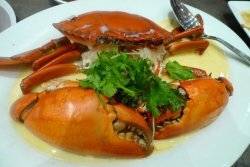 and another type of steam crab with white sauce..~! Had a wonderful dinner at Jumbo while having gathering with a oversea supplier from Japan. So thought having dinner near the hotel that my Japanese supplier is staying. 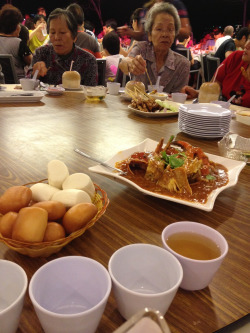 Anyway, has ordered their signature dish - Chiili crabs with fried mini buns! Actually i am not really a crab lover, but has to oder something is special and which can really represent Singapore and is famous among the 'tourist'. Well, my Japanese supplier really love the chilli crabs! Phew.. Felt so relieved that he love the chilli crabs and the mini buns so much!!! He said really lived up to his expectation.